Founded by Larry Hyde in 1979, Hyde Vineyards is located in the heart of Napa Valley's Carneros region. Hyde Vineyards has long been hailed a grand cru-caliber site primarily known for its Pinot Noir and Chardonnay fruit, used by some of the most highly acclaimed wine producers in Napa and Sonoma. 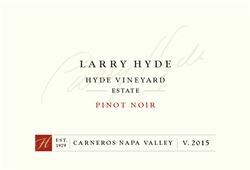 In 2009, Larry decided to debut his own small-lot production Pinot Noir project and today, the Hyde Estate winery is located right in the heart of Carneros looking out onto the acclaimed vineyards near the Carneros Highway corridor surrounded by 25 acres planted to Pinot Noir and Chardonnay. The estate features a state-of-the-art production facility and an elegant tasting room where guests are welcomed to by-appointment seated tastings of estate-grown wines showcasing several varieties made from this unique terroir. Learn more about Hyde Wines at www.hydewines.com or follow them on social @HydeWines. To join the wine club, visit www.hydewines.com or call 707-265-7626.
two levels, 12 and 6 packs including new releases and limited bottling. Locals are offered 10% off their tasting with proof of ID.